SEGA Genesis | Games RA is a place to play all kind of video games, huge selection of action, adventure, puzzle, rpg, retro, fighting, halloween, shooter games online in your browser, no download required. All games in category "SEGA Genesis"
Streets of Rage 3, known in Japan as Bare Knuckle III (ベア・ナックルIII) and subtitled Tekken Seiten (鉄拳聖典, lit. Iron Fist Scriptures) in pre-release media and the official soundtrack release, is a side-scrolling beat 'em up released by Sega in 1994 for the Sega Mega Drive/Genesis. It is the last part of the Streets of Rage series. It was later released for the Japanese version of Sonic Gems Collection for the Nintendo GameCube and PlayStation 2, and for the Wii Virtual Console on September 24, 2007. The game also appeared in Sonic's Ultimate Genesis Collection for Xbox 360 and PlayStation 3. The game features several enhancements over Streets of Rage and Streets of Rage 2 such as a more complex plot, multiple endings, longer levels, increased difficulty, more in-depth scenarios (with interactive levels and the return of traps like pits) and faster gameplay (with dash and dodge moves). Weapons could now only be used for a few times before breaking and could now be integrated with unique moves with certain characters, hidden characters were added and a few cutscenes were included to give the story greater depth. 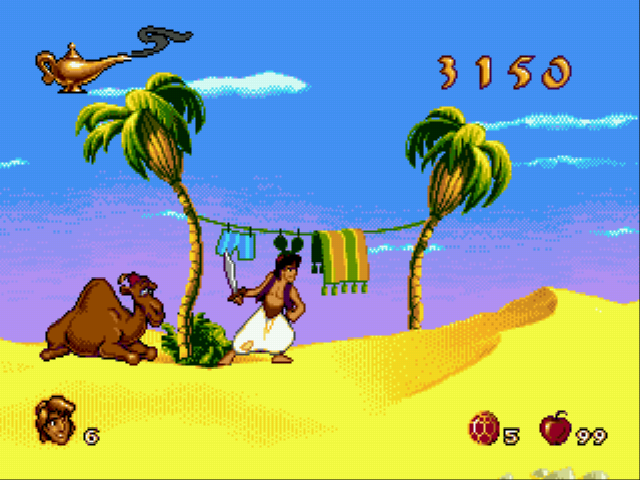 Aladdin (Arabic: علاء الدين‎, ʻAlāʼ ad-Dīn, IPA: [ʕalaːʔ adˈdiːn]) is a Middle Eastern folk tale. It is one of the tales in The Book of One Thousand and One Nights, and one of the best known, although it was actually added to the collection in the 18th century by Frenchman Antoine Galland (see Sources and setting, below). Alien Soldier (エイリアンソルジャー?) is a side-scrolling run and gun video game developed by Treasure for the Sega Mega Drive. The game was released in Japan and Europe, but not physically in the US (one of the few to be released in this pattern), but it can be rather expensive due to its rarity in either region. The game was playable in America on the Sega Channel cable service and has been reissued for PlayStation 2 as part of the Sega Ages Treasure Box disc. 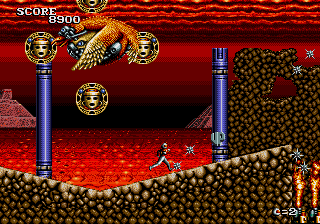 The Sega Ages version, whose disc also includes Treasure's Gunstar Heroes and Dynamite Headdy, exceeds the Mega Drive's intrinsic sprite display limit, which eliminates slowdowns or missing graphics during busy scenes (e.g. boss fights with many explosions). Also, the player can select either the sprite-based pixelated graphics of the original game or a new mode that uses certain filters to produce a high-resolution look. The game was re-released again on the Nintendo Wii's Virtual Console download service in Japan on October 9, 2007, in Europe on November 2, 2007, and North America debut on November 5, 2007. The game is listed in Guinness World Records Gamers Edition 2010 under the category "Most boss battles in a run and gun game". The catchphrases seen on the title screen, "FOR MEGADRIVERS CUSTOM" and "VISUALSHOCK! SPEEDSHOCK! SOUNDSHOCK! NOW IS TIME TO THE 68000 HEART ON FIRE! ", describe the game's technical prowess for the Mega Drive hardware, at the core of which is the Motorola 68000 CPU. Batman also known as Batman: The Video Game is a video game released for the Sega Genesis, which was inspired by the Tim Burton-directed Batman film from 1989. The Genesis version was also produced by Sunsoft. Critics were impressed by its graphics, sound, and playability. The game is more faithful to the film's plot than the NES version and features levels in which the player controls Batman's vehicles. 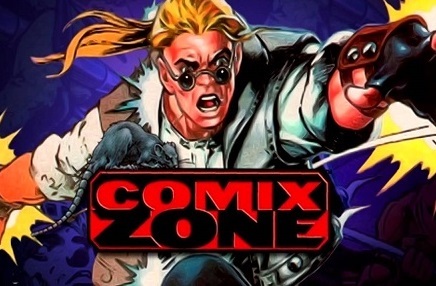 Comix Zone is a 1995 arcade-style action game. The game's unique feature is that it is set within the panels of a comic book. Each level consists of two pages and secrets are discovered by shredding the paper and revealing items. The unique dialogue is rendered within talk bubbles with the typical comic font. Sprites and backgrounds possess the bright colours and dynamic drawing style favoured by superhero comics.Comix Zone was criticised for being released too late and for being too hard and short, but it was positively received and praised for its gameplay, graphics and soundtrack.The music was composed by Howard Drossin, a known video game and film composer. Concept art was done by Filipino comics artists Tony DeZuniga and Alex Niño.The game was originally from a concept video animated by Peter Morawiec titled "Joe Pencil Trapped In The Comix Zone". The video was made in 1992, displaying the animation of how the gameplay and the comic book elements would blend in. Contra: Hard Corps is a side-scrolling run and gun-style shoot-'em-up video game released by Konami for the Sega Genesis in North America and South Korea in 1994. It was also released for the Mega Drive as Contra: The Hard Corps (魂斗羅 ザ・ハードコア Kontora Za Hādo Koa?) in Japan and as Probotector in Europe and Australia . It was the first game in the Contra series released for a Sega platform and serves as a departure from preceding games in the series in many ways. Set five years after the events of Contra III: The Alien Wars, a terrorist group led by the renegade Colonel Bahamut have stolen an alien cell recovered from the war and now intends to use it to produce weapons. Instead of the traditional Contra heroes of Bill Rizer and Lance Bean, a new task force known as the Hard Corps (with four members) are sent to deal with the situation. The game features a branching storyline with multiple possible endings. Cooler Sonic in Sonic 3 & Knuckles is a hack based on Sonic 3 & Knuckles hack features new sprites. Doctor Robotnik's Plan B is hack based on Sonic the hedgehog made by Painto the hack focused on new boss fights. This one is the same exact version as the last release except one small bug, due to focus on Scorched Quest.Features:* 7 new boss fights - the zones consist only of these, as nobody feels like playing S1 over again with just new bosses. The bosses are using (mostly) original zone boss weapon in more or less direct way, except for SBZ, which originally didn't had a boss.Besides from the main point, I added small little features:* Normal and Time Attack mode - added these after suggestion from my Team, so the game has a bit more replay value. In Normal mode you get 5 lives, while in Time Attack you have infinite amount of these. The progress isn't saved so if you get a Game Over, you need to play it again (Normal mode only, as TA doesn't have Game Overs). Earthworm Jim is a 1994 run and gun platforming video game developed by Shiny Entertainment, featuring an earthworm named Jim in a robotic suit who battles evil. The game was released for the Sega Genesis in 1994, and subsequently ported to a number of other video game consoles. It was well received by critics, and received a sequel, Earthworm Jim 2, in 1995. Fifteen years later, Gameloft developed a high definition remake for the PlayStation Network and Xbox Live Arcade, titled Earthworm Jim HD, in 2010. Earthworm Jim 2 is a run and gun platform video game starring an earthworm named Jim in a robotic suit who battles evil. It is a sequel to the original Earthworm Jim, and the second and final game in the Earthworm Jim series developed by original creators Doug TenNapel, David Perry, and Shiny Entertainment. It was released in late 1995 and early 1996 depending on region and video game console, initially being released for the Sega Genesis, before being ported to many other consoles. Fire Shark, released in Japan as Same! Same! Same! (鮫!鮫!鮫! ), is a 1989 shoot 'em up arcade game developed and published by Toaplan. 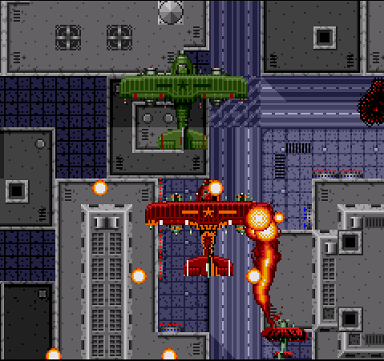 The player controls a biplane and builds up a score by shooting a variety of military targets.It is considered the sequel to Flying Shark.